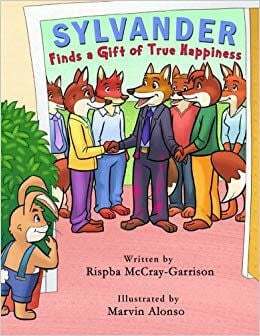 This well composed, cleverly written book for children, explains how helping, caring for one another, especially in times of danger, fosters forgiveness, happiness, thankfulness, and sharing joy and love with others. Silva of Sylva in Latin means forest. It’s in the forest that Sylvander, a very wealthy, respected resident of Foxville, a town near a forest, despite everything he has, is a very, very unhappy fox. After an unfortunate encounter with another resident, it leaves Sylvander feeling angry and sadder than he’s ever been. He escapes into the nearby forest. He realizes he’s lost, really lost. He’s hungry, hears barking, and other noises coming closer that scare him. He sees a rabbit, who foxes enjoy consuming, but who’s able to convince Sylvander he’s in “big” danger and takes him to his home where Sylvander will be safe and give the fox something to eat. The rabbit goes out risking his life to cover up the trail so the dogs and hunters won’t find them. After the rabbit returns, they eat, talk and laugh about many things. Before the sun sets, Sylvander is taken by his new friend, whose name he doesn’t even know, to the edge of the forest. In the distance he recognizes Foxville. Before following the path home, his new friend, Lucky, gives Sylvander a very special gift to remember the time they spent together that changed Sylvander’s life forever. What was the special gift? You and your children will need to read the book together to find out. I look forward to reading many future books by Rispba McCray-Garrison, a mother, physician, and musician in League City. Using her experiences as a foreign exchange student in different countries as the basis for this work, her first children’s book. Margaret Barno lives in Tyler. She is an avid reader, story and puzzle creator, and called Galveston home for 17 years.